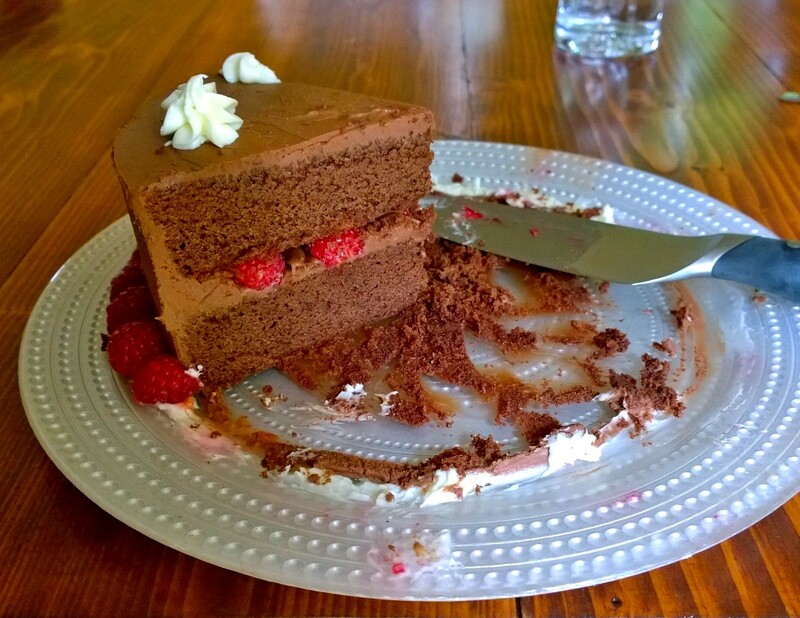 I have always struggled with gluten free chocolate cakes. Back when I was firstly (and incorrectly) told I had Coeliac Disease, my mum bought me a cook book that had a recipe for chocolate mud cake in it that failed every time. It would look amazing while it was cooking and then sink as it cooled, even if I turned the oven off and let it cool down in there at a slower rate. It tasted great but it was so disappointing to look at. The next time I made a chocolate cake, it was the ‘Flourless Chocolate Cake’ from Dr Sue Shepherd’s Too Irresistible for the Irritable, p 130, which I have heard has since been replaced by her other cookbooks. It was delicious, moist and easy enough to make. The only problem is for me it was a little too heavy and rich. My mum loves it, and almost didn’t let me take the book with me when we moved to Seattle. I prefer cakes that have a little more “fluff” to them, if that makes sense. 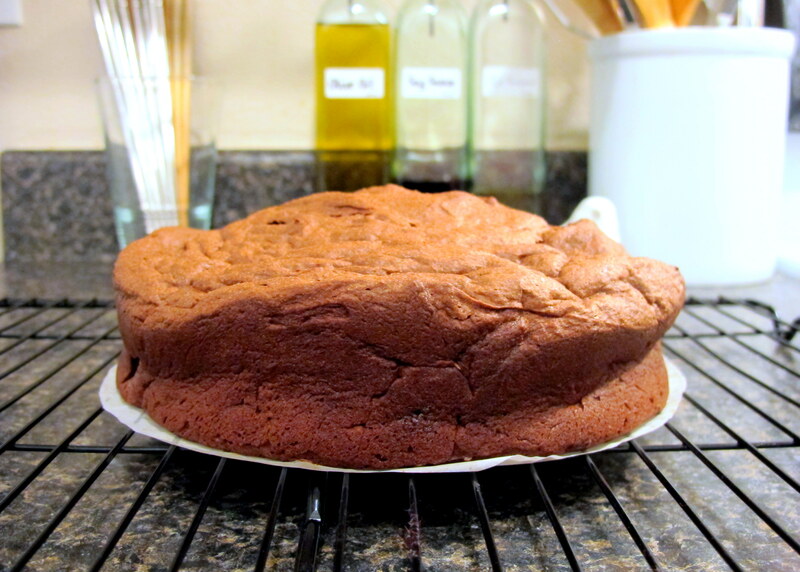 For this cake I decided to combine the flourless chocolate cake recipe mentioned above with a more typical chocolate cake recipe and see what happened. What happened was good! To begin with I wasn’t sure if I liked it… I mean, I liked the taste but it wasn’t as in your face sweet as some mud cakes are so it tasted different – my taste buds/mind were confused – but I was aiming for a less-sweet cake; after I put from my mind what I remembered sickly sweet mud cakes to taste like and just enjoyed this cake for itself it was delicious and moist and rich, without the sugar headache later on. I think the biggest compliment was that two non-dessert eaters went back for seconds… because it wasn’t too sweet for them. Cocoa powder is safe in 3 tsp. 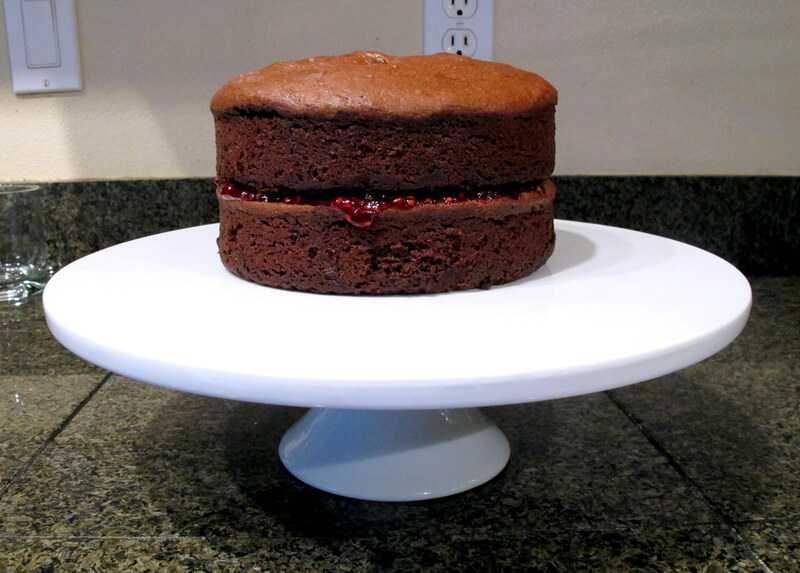 servings – you won’t get nearly that much in a 1/16th slice of this cake. Butter is low in lactose but, if you can’t tolerate it or you’re dairy free, just replace it with coconut oil. Dark chocolate is safe in 30 g serves – if you stick to 1/16th slice of this cake without icing, you’ll be eating less than 10 g. If you add the chocolate ganache, you’ll be eating 20 g of chocolate, so still considered deliciously safe. Almonds are low FODMAP in servings of 10 nuts and the 1/4 cup almond meal called for in this entire recipe, divided by 16, is very safe. 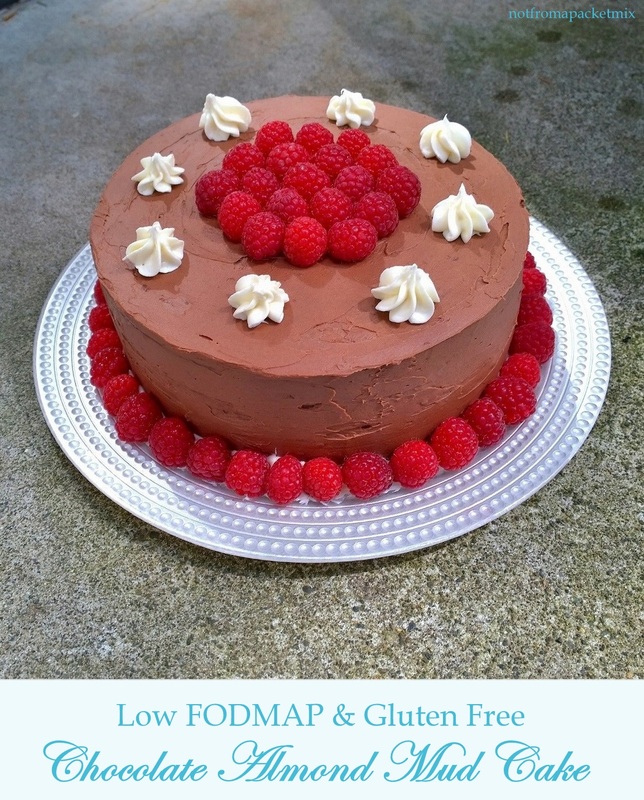 Xanthan gum is low FODMAP, though some people can react to with it for other reasons. Brown sugar is low FODMAP in the amount called for per serve. The addition of dextrose improves the f:g further. Eggs are not high FODMAP. Use lactose free double cream if required, or full fat coconut cream (low FODMAP in 1/2 cup serves, which is then divided by 16 slices). Note: If you have GF self-raising flour, substitute it for the plain flour and omit the baking powder. Pre-heat oven to 150 C/300 F and grease/line a 9″ cake tin. 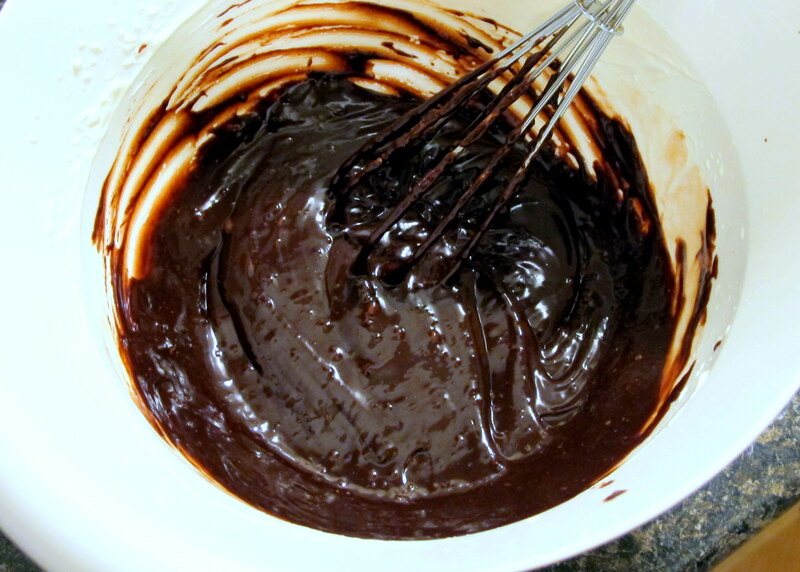 Combine the cocoa powder, water, butter and dark chocolate in a pot and melt slowly over a low heat. Stir occasionally. Meanwhile, separate the eggs and beat the egg whites until light and fluffy. In a large bowl, or the bowl of your stand mixer, combine the flour, almond meal, baking powder, xanthan gum and sugars with the whisk attachment. 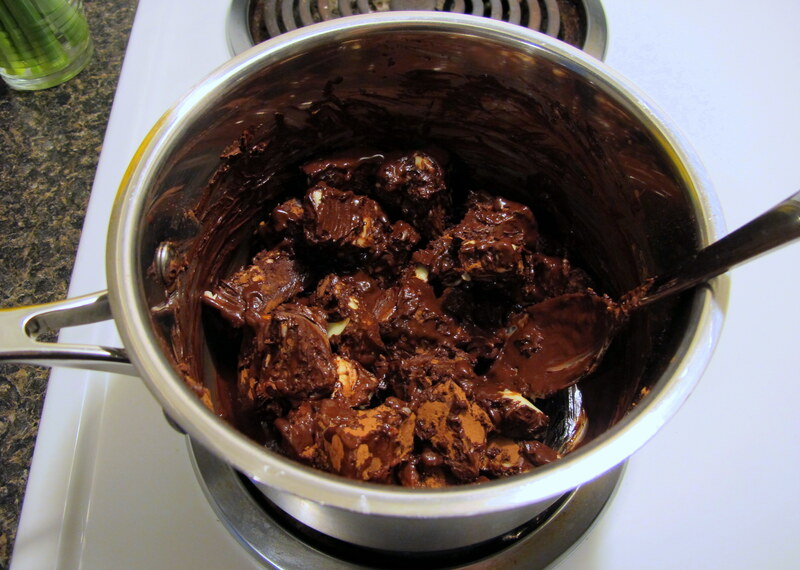 When the chocolate/butter mixture is thoroughly melted and smooth, remove it from the heat and let it sit for 5 minutes. Then, tip in the egg yolks and beat briskly with a fork/spoon/whatever for 30 seconds or so before pouring it all into the dry ingredients and beating on a medium speed until smooth. Gradually add in the egg whites and continue beating for approximately 3 minutes at the same speed, scraping down the edges with a spatula as required. 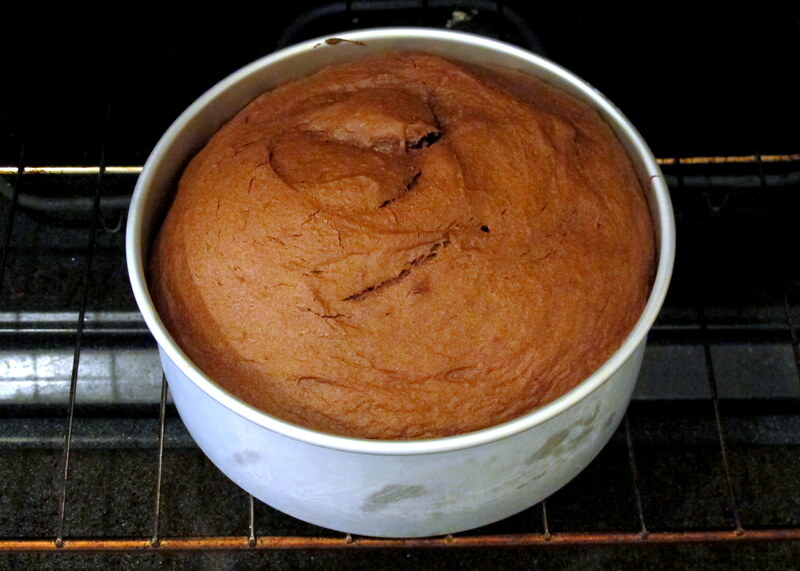 Pour into the prepared cake tin and bake at 150 C/300 F for 60 minutes, or until cake tests clean. Let it sit for 10 minutes before turning it out onto a rack to cool. 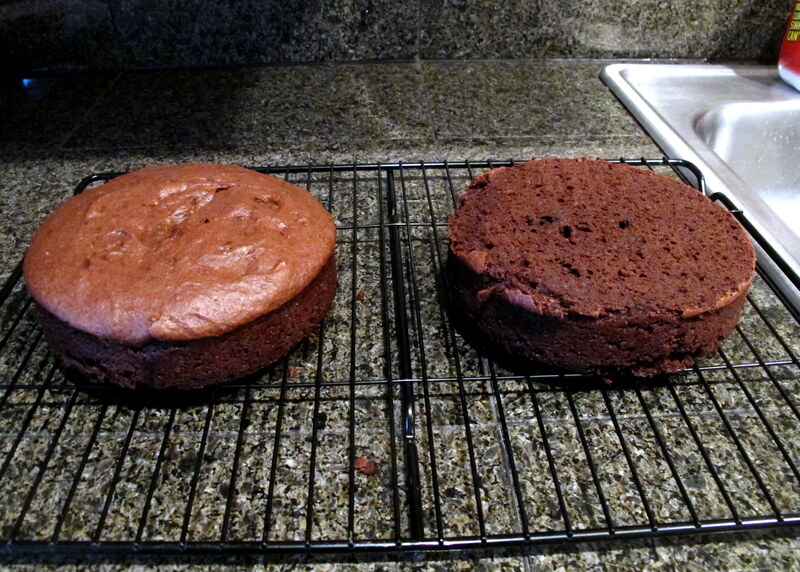 The cake needs to have cooled to room temperature before icing it, or the icing will melt and run off. Below is an example of what happens when you use cheap/bad gluten free flours; the sad little cake is crumpled at the edges. This was the Namaste brand of gluten free flours. Using King Arthur brand or my own gluten free flour blend, I have not had this issue and non-IBS/coeliac diners didn’t realise it was gluten free! If you can’t find lactose free cream, you could alternately dust with icing sugar and cocoa powder, or mix cocoa powder/melted dark chocolate through coconut cream… if you are eating lactose free then you’d probably have more tricks up your sleeve than me for this situation. Put the chocolate chips in a heat proof bowl and set aside. 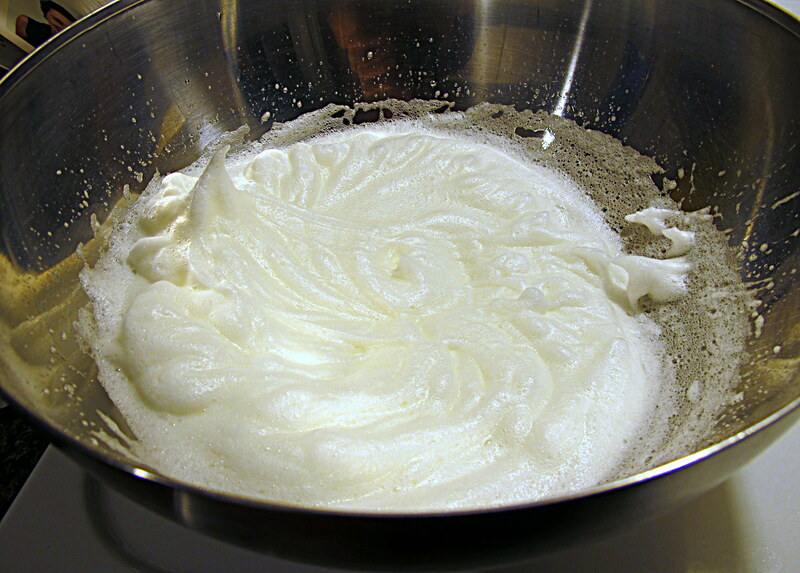 Heat the cream and almond extract over a medium heat, until it begins to bubble at the edges. Remove it from the heat and pour it over the chocolate chips. 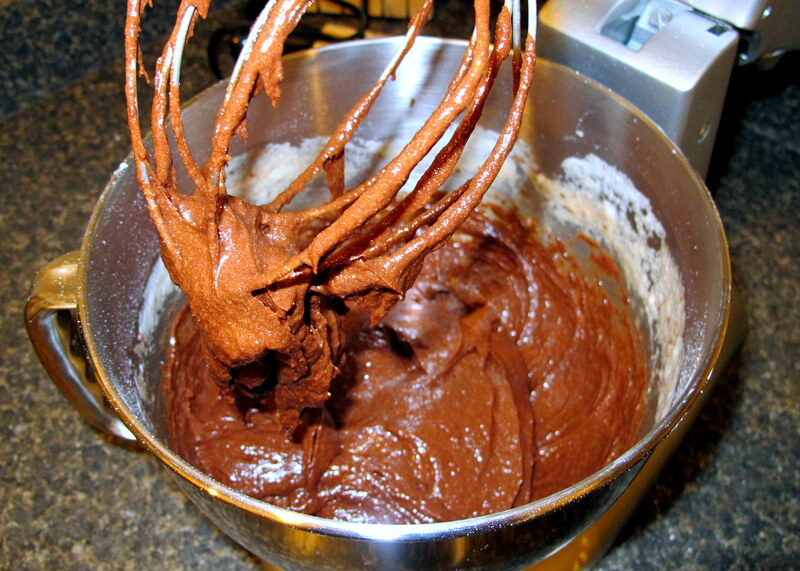 Stir with a fork/whisk until the mixture is smooth and well combined. Slice your cooled cake in half so you end up with two discs. Place the first disc on the dish you plan to serve on and whip the cream and then spread it across the top surface of the bottom cake half. 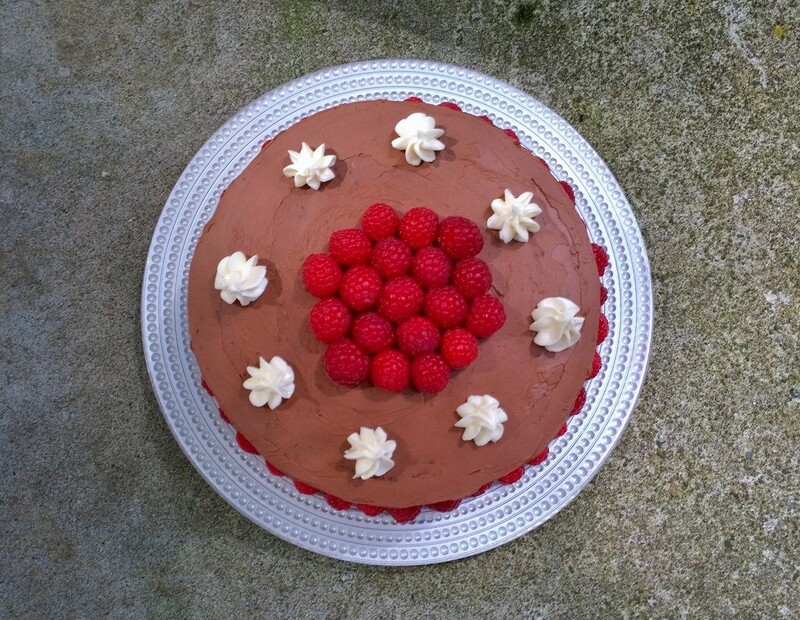 Put the top half onto the whipped cream and cover it with ganache over the top and around the sides, if you wish. Alternatively, you could use a raspberry jam instead of the whipped cream. Decorate with strawberries, or however else you’d like. 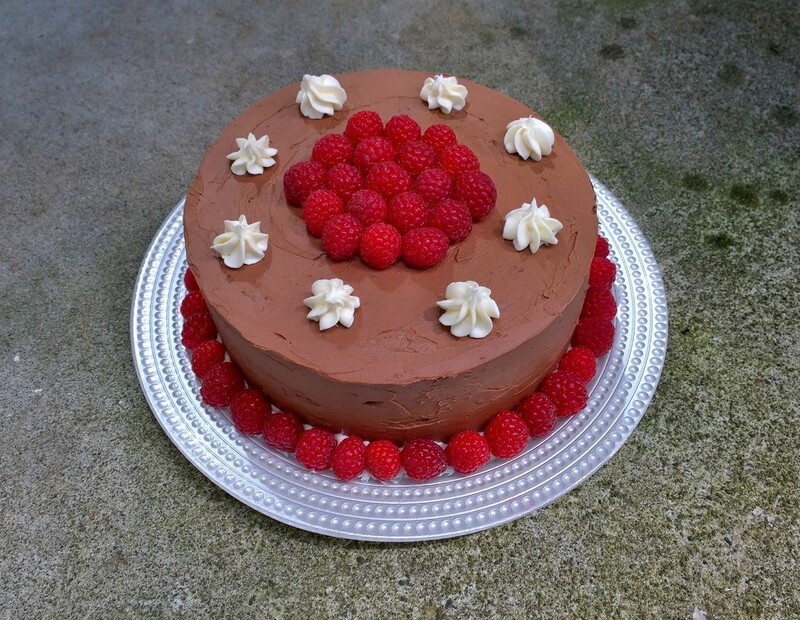 This entry was posted in Sweets and Desserts and tagged cake, chocolate, chocolate mud cake, custard, decadent, dessert, food, fructose friendly, fructose malabsorption, gluten free, home-cooked, homemade, low fructose, moist, mud cake, mudcake, nuts, rich, sweet, Too Irresistible for the Irritable, vegetarian. Bookmark the permalink. That’s interesting – my husband can’t eat any chocolate, chocolate cake, chocolate cookies but the kids can although they otherwise have to follow a lot of the same restrictions as he does. But he has lots of other food intolerances including salicylates, amines and other issues so we put it down to one of those as he gets a migraine along with the gastro problems. It means he should limit the olive oil margarine too, but sometimes it’s too tricky to follow ALL the restrictions. I’m lucky in that my husband doesn’t have any issues, it’s just me, although since he’s become pescetarian it’s been harder to think of veggie meals that don’t get boring or repetitive. It’s a weird one – fructans in cocoa powder but not necessarily in chocolate – possibly due to the processing it has undergone – although there’s the obvious lactose in there. As to who can tolerate it or not, I guess we just need to stick to the original principles of the FODMAP diet and reintroduce what we can. So many people eliminate everything and stay there but all the literature and interviews that I’ve read mention that the point is to let your gut settle and then begin eating the FODMAPs that you can tolerate once more. There was even some evidence floating around that FOS’s are important for gut health, given that they’re fibre.